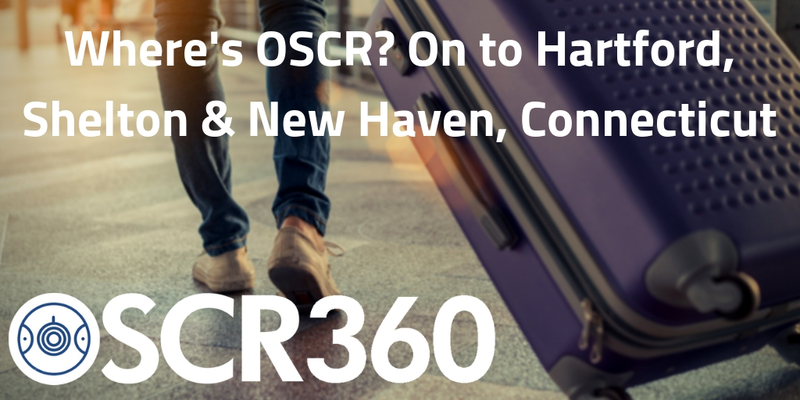 Earlier in December, OSCR and I had a chance to travel to New Jersey and Connecticut. We had a blast exploring this ‘Still Revolutionary’ state (obviously they’re revolutionary if they’re interested in OSCR)! The OSCR team even got the opportunity to meet the famous Dr. Henry Lee, who worked as thif youe Forensic Scientist on the O.J. Simpson case. Let’s jump right in and tell you all about our most recent adventures..
OSCR and I spent a beautiful day strolling along the boardwalk of Egg Harbor Township, New Jersey. Named after the multitude of shorebird and waterfowl eggs covering the meadows, this township in Atlantic County has a park dedicated JUST to stories and fairy tales. I guess if there is any place for Humpty Dumpty to fall on his head, it should be in Egg Harbor Township. If you ever get the chance to visit this part of New Jersey, be sure to stop by a diner and get yourself an omelet in true Egg Harbor fashion. After we had filled up on scrambled eggs, OSCR & I made our way over to the Atlantic Fire Marshal where we gave an OSCR360 demonstration and answered some questions about the technology. The Atlantic Fire Marshal was interested in using OSCR to assist with their fire and arson investigations. They loved when the L-Tron team was able to show them some examples of how OSCR has been used at fire scenes. With the OSCR capture kit & our mega mast, investigators and fire marshals are able to get a complete, 360 degree view of the remains of a building. OSCR can see everything. If any of you are Mark Twain or Harriet Beecher Stowe fans, Hartford is the place for you. The homes of these literary icons are located here, along with numerous opportunities for you to indulge in U.S. history and culture. From art museums and galleries, to farmer’s markets and a variety of cultural festivals, Hartford is the heart (ironic, isn’t it?) of history, aesthetics, and culture. OSCR and I stopped to visit with a few members of the CT Environmental Conservation Police. OSCR has several environmental and hazmat use cases – everything from disaster response to anti-poaching enforcement, from boat/snowmobile/ATV crashes to major hazmat incidents (chemical or pesticide spills or dumping). 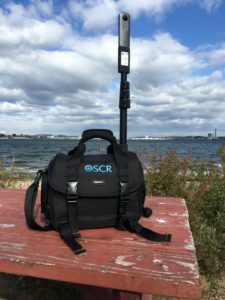 OSCR was even used on several major hunting-related shooting incidents. After saying our goodbyes to Harriet Beecher Stowe, OSCR and I made our way over to Shelton, Connecticut. Located in Fairfield County, the city streets were lined with restaurants and coffee shops (which made it easy to get my caffeine fix). With my caramel latte in hand, OSCR and I wandered the various parks within this quaint city, before making our way over to the Shelton Police Department to introduce another group of Officers to OSCR. From Ivy League hallways, to exquisite architecture, to mouthwatering cuisine, there was nothing about New Haven that wasn’t exciting. There were so many museums, theaters, and festivals to check out, but unfortunately OSCR and I did not have time to catch a show. Just walking by the breathtaking buildings and structures full of intricate details was enough for me. It took us longer than it should have to reach the New Haven Fire Marshal (OSCR insisted we stop to take 360-degree pictures of the ornate architecture and the New Haven Harbor), but we arrived just in time. The Fire Marshal was impressed to learn that OSCR had benefits for every aspect of their day-to-day jobs. 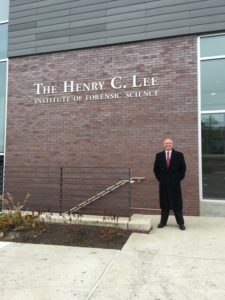 While we were in New Haven, we also stopped by the Henry C. Lee Institute of Forensic Science. We were able to meet Dr. Henry Lee himself! Retired Sheriff’s Deputy, Andy McNeill, made the trip with us, and wrote a great piece on meeting his hero – Dr. Henry Lee. OSCR made an immediate impression on Dr. Lee, and the institute purchased a system to help educate future generations of forensic scientists and crime scene investigators.